Operation Blockbuster has released its long-awaited report (pdf) on the Sony attack that dominated the headlines in 2014. The report is based on a more than one-year’s worth of analysis by Operation Blockbuster coalition members and identifies more than 45 pieces of unique malware used by the attackers. Operation Blockbuster has identified the attackers as the Lazarus Group and has linked the group to several malware families used in other attacks that have taken place in the last seven years. The Lazarus Group’s activities clearly indicate the growing trend of malware developers moving from mass-market attacks – which many security vendors are able to block fairly easily – to very targeted attacks. Targeted attacks rely on information gathered through social engineering, online research, and similar data gathering methods. This information is used to develop spear phishing and other attacks designed to fool victims into taking action desired by the attackers. These attacks often bypass traditional security methods. The security industry has observed tremendous growth in these methods over the past decade. We've published a recording of our recent webinar on securing Office 365. This webinar was featured in the recent MSExchange CON, and is hosted by Michael Osterman and Rich Turner. According to reports from ABC Australia (http://www.abc.net.au/news/2015-05-11/new-computer-ransomware-encrypts-files-asks-for-up-to-1000/6461606) a new crypto ransomware threat is circling Australian’s email inboxes. 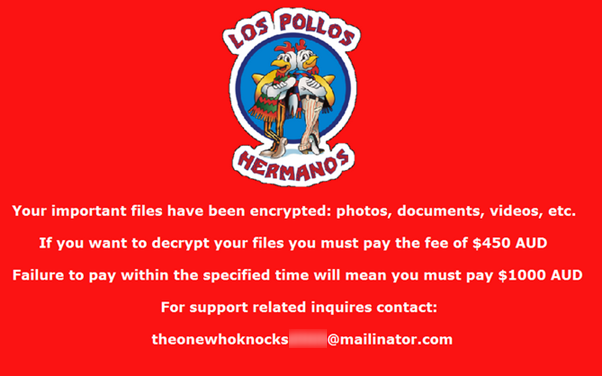 This latest version of Cryptolocker takes on the branding of the late, great, popular tv show, Breaking Bad. It uses the “Los Pollos Amigos” name, which is the restaurant that provided money laundering and was the base for other functions on the show. The ransomware also links to a video that shows victims how to use bitcoin, which was likely included to help the victims pay the ransom. Researchers believe that the ransomware is spread via email, and downloaded through an infected zip attachment. Barracuda Email Security Service and Barracuda Spam Firewall customers are protected from these types of emails. Ransomware a is particularly sinister attack, because it forces you to interact with the criminals in order to get access to your data. This particular version even includes the phrase “the one who knocks” in the email address, which is just insult added to injury for those who are familiar with Breaking Bad. Most of you reading this blog are IT pros, so you already know how to deal with malware, and you’ve probably already heard of Cryptolocker. This Breaking Bad version gives you a good opportunity to revisit your Cryptolocker defense plan, including security software, your backups, and the overall state of your network. 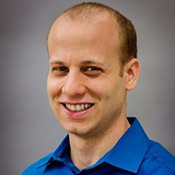 Are your users protected from malware, and ransomware in particular? Is there anything more you can do? Cryptolocker designers are modifying their business model to remain an effective an active threat. Cryptolocker isn’t going away anytime soon. Secure your threat vectors, protect your data, and follow best practices, to ensure that you are not a victim. And the scam attacks keep on coming, reinforcing how important it is to require proper procedures and verification for financial transactions. In the latest one, the CFO of a company receives a series of emails from “the CEO”. Fortunately, he recognizes that they are bogus, and never replies. The scammer becomes progressively more impatient and demanding in further messages. I need to know if you can still process out an Domestic transfer today. Amnesty International's UK website has been compromised and is serving drive-by downloads. Historical data indicates the website AIUK was compromised on or before Friday, December 16. Visiting hxxp://www[.]amnesty[.]org[. ]uk loads hxxp://3max[.]com[. ]br/cgi-bin/ai/ai.html via an iframe. 3max.com.br, which itself is a legitimate but compromised Brazilian automotive website, loads malicious Java content (stolen from the Metasploit project), which targets CVE-2011-3544. If the exploit is successful, malware is installed on the visitor's system.